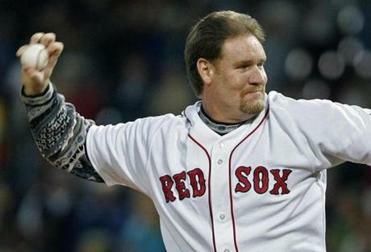 Wade Boggs has earned his place in Red Sox lore. A great injustice in Red Sox history was corrected this week when Red Sox chairman Tom Werner called Wade Boggs to tell him his No. 26 will be retired in a ceremony May 26 at Fenway Park. “Tom told me, ‘Better late than never’,” said Boggs from his Tampa home. “I’m so grateful. I thought it may never happen, and over the years I’ve wondered if it ever would. But I’m very appreciative of this honor. It was an honor and privilege to wear the uniform for the Red Sox and to have played as long as I did. Boggs is also negotiating a possible role with the team, which might include being a spring training hitting coach much like Ted Williams and Carl Yastrzemski did. Boggs, 57, said it was long his father Win’s wish to see his number retired on the right-field facade next those of Williams, Yastrzemski, and one of his mentors, Johnny Pesky, whose hard work hitting Boggs ground ball after ground ball before games turned Boggs into a Gold Glove third baseman. The Hall of Fame third baseman will be the ninth Red Sox player to have his number retired. Boggs, who also had his No. 12 retired by the Rays, has the highest career batting average at Fenway — .369, 8 points higher than Williams. Brock Holt, who currently wears No. 26, will switch to No. 12, the team announced..
Just why Boggs was denied this honor for so long remains unclear. Is it coincidence that the decision to honor Boggs coincides with Larry Lucchino’s departure as team CEO and president? There’s no doubt that Boggs going to the Yankees and riding the horse in celebration of the Yankees’ championship in 1996 never sat well with the Red Sox. But the current Red Sox ownership wasn’t a part of Boggs’s career in Boston, which made the slight that much more puzzling. Boggs’s .338 batting average with the Red Sox is second to Williams (.344). He played more games (1,520) at third base in 11 seasons than anyone in team history. Boggs helped the Red Sox to three postseasons, and his No. 26 will join Bobby Doerr’s No. 1, Joe Cronin’s No. 4, Pesky’s No. 6, Yastrzemski’s No. 8, Williams’s No. 9, Jim Rice’s No. 14, Carlton Fisk’s No. 27, Pedro Martinez’s No. 45, and Jackie Robinson’s No. 42, which is retired throughout Major League Baseball. This is why the team’s snubbing of Boggs is so silly. The Red Sox turned their back on a player who in Boston made eight All-Star teams, had a .428 OBP, won five batting titles and six OBP titles, and had seven straight 200-hit seasons. For his career, he hit .328, had 3,010 hits, and scored 1,513 runs, third most by a third baseman all time. Boggs was inducted into the Hall of Fame on the first ballot in 2005. He wore a Red Sox cap to boot. And the Red Sox kept ignoring him. They didn’t give out No. 21 (Roger Clemens), No. 33 (Jason Varitek), or No. 45 (Martinez), but they gave out Boggs’s number like candy. In addition to Holt, 12 others to wear No. 26 after Boggs left the Red Sox include Lou Merloni, Wes Chamberlain, Alejandro Pena, Lee Tinsley, Aaron Sele, Freddy Sanchez, and Ramiro Mendoza. “When I was drafted by the Red Sox I remember my dad telling me that Fenway Park was going to be a great ballpark for me. As I got stronger and was able to hit the ball to the wall, that was certainly true. I loved hitting at Fenway. It was indeed the perfect ballpark for me,” said Boggs, who had a .991 OPS at Fenway along with a .464 on base percentage. “This is the icing on the cake for me. This was the last piece of my career that I looked forward to. The Hall of Fame was incredible, but I always wanted to be recognized by the team I loved being a part of. The Red Sox are the team that gave me my first chance, and I’ll always be grateful. I can’t wait for the ceremony. It’s a nice touch they will have it on the 26th.